Located at the lap of the great Himalayan range, Jammu and Kashmir is the northern most state of India. Kashmir is often compared with a piece of heaven due to its exotic, splendid and mesmerizing scenic beauty. In spite of having political conflicts regarding the border of the state with the neighboring nations, Kashmir never ceased to be an ace attraction for both domestic and international tourists, when it comes to visiting the best places of India. Misty Himalayas, serene lakes, mild atmosphere, colorful local culture and mouth littering foods are the featuring points of Kashmir tourism. Kashmir is a valley, surrounded by the Himalayan mountain range and this is why climate remains cool and calm throughout the year. If you want a quick escape from the scorching heat of the plains of India, then Kashmir is a must visit destination for you. Summer is very much soothing in this state, while winter becomes chilly. Snowfall is also experienced in some parts of Kashmir during winter season. Hence, anytime between October to May, Kashmir can be visited. It is wise to avoid rainy season as road blocks may be experienced during this time due to landslides. Gulmarg is a small sub-urban hill station of Kashmir valley. It offers glimpses of snow clad mountain peaks, whispering clouds floating above head and a lot of fresh air to breathe. Gulmarg boasts of having one of the highest golf courses of the world. 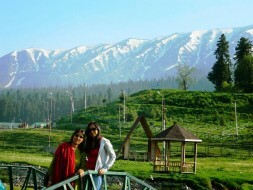 The name Gulmarg signifies meadow of flowers. This place is a natural valley of flowers indeed. Rhododendron, Orchid, etc. are some of the common flowers that you will find scattered throughout the place, creating a colorful as well as a gleeful aura. For hikers and trekkers, Gulmarg is a suitable place. During your Kashmir holidays, visiting Sonmarg is highly recommended. Sonmarg means the meadow of gold and such nomenclature has been done as the place is surrounded by snow capped mountains, offering a splendid golden color view during dawn and dusk. It takes a short drive of 2 – 3 hours through the steep and curvy hill paths to reach Sonmarg from Srinagar. When you are at the paradise of Earth, Kashmir, do not forget to include a short trip to Ladakh in your holiday in Kashmir. Observing the virgin beauty of nature, from a steep altitude will be the most memorable moments of your life. Though nature is harsh on the living beings of this place as it remains nippy, windy and dry all round year, Ladakh is considered to be the perfect place for the travelers. Do not expect utmost luxuries during your stay in Ladakh as there are no five star or four star hotels for the tourists. Staying a couple of night in tents is recommended for the tourists if they want to get up close and personal with the nature. Hence choose Kashmir holiday packages, which include this mind blogging place in its itinerary.